Chilima gets a rousing reception from the packed crowd at Njamba (file photo). Vice-President Saulos Klaus Chilima , who is leading United Transformation Movement (UTM) a breakaway from ruling Democratic Progressive Party (DPP), has said he will introduce "lifestyle audit "-- an anti-graft initiative that, if implemented, would require all public servants including businesspersons to show how they earned enough to afford the mansions, ranches and luxury cars so many of them own. 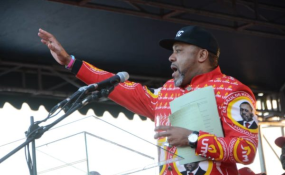 Chilima spoke at Kamwendo Trading Centre in central region border district of Mchinji on Saturday at a political rally by his UTM after he earlier conducted whistle-stop meetings from the capital Lilongwe to the venue of the rally. He said public servants and other people will be asked to explain the source of their wealth and those found culpable with the plunder of national resources will be required to defend their source of wealth. "People should be able to explain how they acquired a house or property in comparison to what they earn," he said. Chilima said the lifestyle audit will be among various measures to put in place by the UTM government to curb wrongful enrichment and corruption. The UTM leader said his movement is ready to usher in the change Malawi needs among others to genuinely fight corruption, end nepotism and impunity - which he accused the Democratic Progressive Party (DPP) led government of perpetuating the vices. SKC - as Chilima is fondly called by his supporters - said corruption has destroyed Malawi, costing the public good service delivery in health, education, agriculture and infrastructure development sectors. The Vice-President also said he would do away with the Farm Input Subsidy Program (Fisp) and introduce universal subsidy program where strategic farm input products would be subsidized for all Malawians to access at an affordable price. He also said his government would promote mechanized farming where cooperatives would access farm machinery such as tractors to be used at cooperative level. The UTM leader also said he will introduce pension scheme for all Malawians aged 65 years and above once he becomes the country's president. He disclosed that there will be a welfare benefits pay for those on retirement. Chilima maintained his pledge to create one million jobs, abolish the quota system of selecting students into public universities, end presidential immunity from prosecution while in office, increase teachers' salaries and make Parliament the appointing authority of the Anti-Corruption Bureau (ACB) director general and other important positions, in the first year if elected president in the 2019 Tripartite Elections.